As the single most important element of your organization’s infrastructure, you count on your computer network to securely share key resources, including databases, files, printers, e-mails, etc. And getting it wrong can be costly: Aberdeen estimates that downtime costs companies an average of $42,000 per hour. 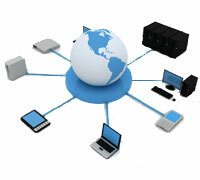 At Harrison Consulting, Inc., we build computer networks with an emphasis on “getting it right the first time”... We work closely with each client to define business and technical requirements for your business, employing a highly consultative approach to designing a network solution for your business. By employing highly reliable rack mount servers and managed switches on every installation, we guarantee the seamless, fault tolerant operation of your computer network, freeing you to concentrate on what’s important: your business. Harrison Consulting, Inc. identifies vulnerabilities and implements regimented backups, password management, data security policies, vulnerability network scans, virus and malware protection and physical access controls. We protect your information from natural disasters, hardware failure, and attacks originating from both inside and outside your network. Harrison Consulting, Inc. offers service contracts that allow your business to outsource all is support needs for one monthly low fee.